"We are very happy with these nappies, which we use when out and about as the rest of the time we use washables. They fit well and are good for our little ones skin. Great to support the environment as that is important to us. Beaming baby customer"
once fidget bum has got his beaming baby diaper on for the night, it can last from 8pm till 9am, it's full of wee but I don't need to worry about changing him in the middle of the night and no diaper rash...brilliant, can't do without them. My little one has had severe eczema since she was 2 months old. Any other time I have used other diapers the skin that's in contact with the diaper breaks out and flares. That does not happen with Beaming Babies. can hold a lot of wee! Poo occasionally escapes through the top of the diaper but they can hold a lot of wee! Easy to order, good quality, arrive quickly. AMAZING!! I love these diapers. I tell everyone I come across who has a baby! So many of my friends have started using them too. My little boy has been wearing them since birth and we never have any poo leakages and the only wee leakage has been due to me not the diaper! My daughter seems to find these very comfortable. They're highly absorbent and seldom leak when fitted properly. Bio degradable is a big plus. The website is well organised and easy to navigate. The whole buying process and also the speedy delivery are great. We started using the Beaming Baby's products soon after our son was born and will keep using them for some time as we are very happy with them. We use the bio-degradable diapers, wet wipes and diaper bags and are happy to say that our little one had never had any diaper rash. These diapers do the job just as good as the big brands but with the major bonus of not littering the planet for hundreds of years! We wouldn't use anything else. Best eco diapers I have used by far. They last well over night without starting to break up like other brands. Really thrilled! Still after 4 months no diaper rash cream used! Love the fact that they are biodegradable! Great product, well done! Love these diapers! My partner is somebody who is extremely concerned about over use of chemicals, and he wholeheartedly approves of these fantastic diapers. It is great that part of the diaper is compostable and our local council even agreed we could compost the diapers in the recycling compost bin. Baby does too. An Eco diaper that doesn't leak easily! My son is comfy in them and they last all night. I love the fact that they are soft and don't have the horrible chemical smell that a certain leading brand has. I've had to go up a size earlier than they state but that's not an issue. Very happy. I was a bit sceptical about eco diapers thinking that they would be an under-performing product, but I was wrong! These diapers are strong, beautifully fragranced, they are absorbant, cause no diaper rash and keep my little one dry all night long, oh and not to forget they are very stretchy too! I think they are great value for money. We haven't had any rashes. We do have leaks pretty regularly but I have had this problem with other supermarket brands that aren't biodegradable.I think the odd change of clothing is worth it for the environment. We use these disposable diapers in conjunction with reusables, for out and about and overnight. Before I got these I was using up some outgrown big brand diapers given by friends, and had resigned myself to thinking that over night leaks were inevitable. Not so, these have never leaked. Better than leading brands AND green! Wanted to find a green alternative to leading brands but thought that would mean compromising on efficiency. Not the case at all. A hard working diaper that can hold a lot. No skin irritation either. Slight leakage at the side but my son frequently sleeps on his side so it is to be expected. We love these diapers and the wipes and diaper bags. It's great that everything is biodegradable. No chemical smell like other leading brands. No diaper rash. No leakages due to soft elasticated areas around thighs. Fits perfectly. Worth the price. I've been using Beaming baby diapers since LO was born. They are great, he's 4 months now and we've never even seen what diaper rash looks like. I wasn't 100% happy with buying pampers due to the ""ingredients"" list that's on the packet. I also found that my baby also smelt of urine and when nursing, my hand did too. I bought beaming baby diapers just as a trial and I am mighty impressed. There is no urine smell when the diaper is full and my baby is kept dry... The only downside is the price but after watching the video I may just give the washable diapers a go whilst around the house, this will keep the price down and allow me to keep buying beaming baby. Super impressed..!! Quick and easy with lovely products. After opening a packet of Lidl brand diapers and smelling and potent smell I was straight onto purchasing these after receiving a sample pack. They arrived quickly and well packaged. They do not smell terrible like my previous experience. The hold moisture really well. My baby boy had used only Beaming Baby diapers. They fit perfectly, absorb a lot though its easy to feel when they need changing and are very gentle on his skin (no diaper rash at all) and importantly they dont 'scratch' the nature as they are completely biodegradable. Buying in bulk simply means you are sorted for a while and can enjoy these precious moments with the little one. My baby stayed dry even though her nappy was basically a water balloon by morning. Used pampers for first few weeks and our baby had diaper rash and we were feeling so guilty about the time it takes diaper to degrade! 400 years! We got free samples of beaming baby off the website to try them first which was helpful. After 2 weeks of using beaming baby- the diaper rash went and she hasn't had any rash at all since- she is now 4 months old. Thank you! I would prefer not to pay for postage when I spending so much! The diapers can't be rivalled! They are absolutely amazing. We started off trying a variety of other diapers but then used our trial pack and haven't looked back! They are firstly far better for the environment but what surprised me most is how absorbent the diapers are. My little girl can go for up to 13 hours without being uncomfortable. She is much more settled, taking the cry for a wet diaper out of the equation! Love them. 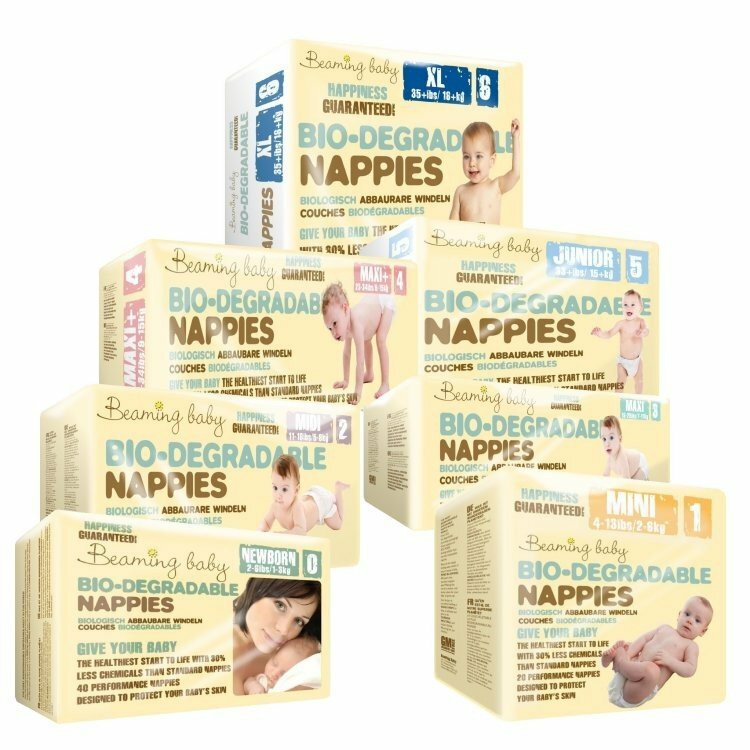 Highly recommend to anyone who wants to use disposable nappies! Amazing for our baby's skin l. Whenever we find outrselves using a more mainstream brand he ends up with a rash but not with Beaming Babies diapers! And it's amazing that they're so much better for the environment! Very satisfied with the service and the quality of the disposable diapers. Have ordered them before the baby was born, in different sizes. Happy to say that 3 months in, I don't know what a diaper rash is. We have been using Beaming Baby diapers since day 0 with our 4th child and I so wish I'd found them with the other children. I've rarely noticed any leaks, and he has never EVER suffered one bit with diaper rash, not even when teething! Eco-friendly, smell lovely, and beat regular brands hands down! These are the only brand of eco diapers that fit my baby well and don't leak overnight - they're elasticated at the back as well as on the side tabs. In any other diaper he was getting wet clothes and bedding at the top of the back of the diaper. Wish I'd discovered them earlier! I have 3 children, these are the best diapers I've ever used. Wish I'd discovered them earlier!